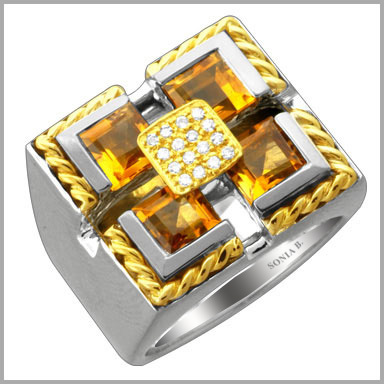 Sterling Silver / 14K Gold Citrine & Diamond Checkerboard Ring.Price includes 30% discount. Set the fashion bar with chic shine. Crafted in sterling silver and 14K yellow gold, this ring features four princess cut 5mm citrines in channel settings. It also features 16 full round cut diamonds in prong settings making up a square at the center. This ring truly shines with a yellow gold twisted rope design at the perimeter. The total citrine weight is 2.76ct and the total diamond weight is 0.08ct (both approximate). The diamond color is H-I with a clarity of SI-3. 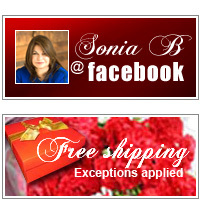 The setting size is 5/8" x 11/16" with a height of 3/16". It also has an undergallery for added beauty and comfort.